My Grandson Bryan came up to visit this week. He knew I made canes and asked me to make him one. 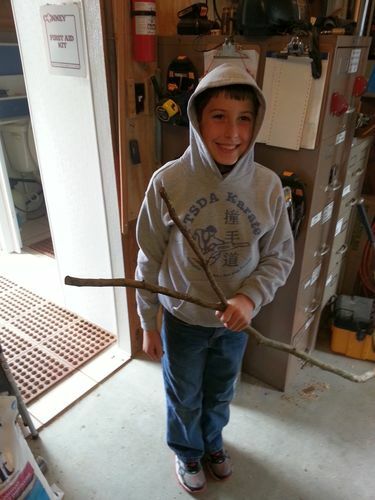 After talking with him and his mother we decided he’d much rather have a wand. He’s a big fan of the Harry Potter movies and decided he wanted The Elder Wand. 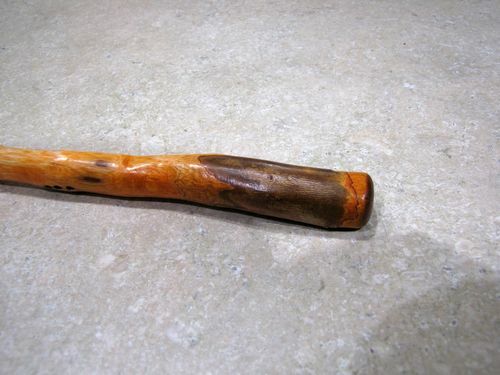 I’ve never tried making a wand before, but they are just miniature canes so I thought I’d try something a little different, putting a natural branch in the lathe and turning that. We went to the branches stack and picked a Crepe Myrtle branch I thought would do the job. One of the branches from the “Y” was long enough and reasonable straight so I cut it off. I chucked it in the lathe to see how “off axis” it was…it was….WAY off axis. So my plan to use a strip of sandpaper to smooth it down wasn’t going to work. 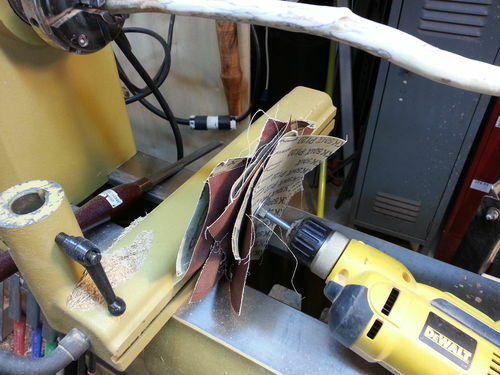 But, I do have several flavor of sanding mops so I decided to chuck one up in my sanding drill and run the lathe on low speed while I sanded it smooth. So I got a big 220 grit mop and started sanding. The mop was doing what I wanted on the branch, but the bolt wasn’t big enough to hold in the drill chuck. So about the 4th time it fell out I decided to make a smaller one with a smaller, longer bolt. I had the materials already left over from the sanding mop project so in a few minutes I had a smaller version up and running. Bryan popped back in to check on me and I showed him my progress. He got quiet for a second and then said “So how will you make it straight? The elder wand is straight.” So I realized that although I was having fun trying something different to make it unique for him he just wanted the elder wand. Not to worry. I had proven the technique of using the sanding mop to turn a crooked branch so I knew I could make others that way. 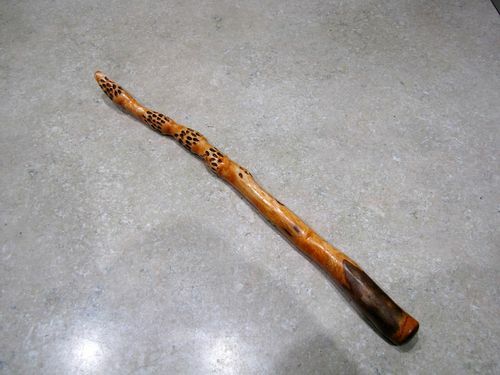 I decided to finish the crooked wand in the fashion of the elder wand. After I finished sanding the rough shape I took a 320 grit sanding mop and sanded the wand smooth. 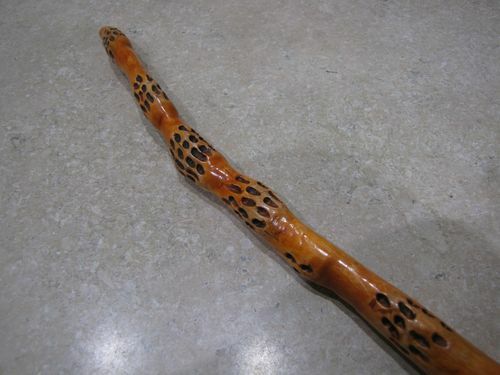 As the elder wand had dimples on the bulged areas I had to do the same. I had left several bulges along the branch and decided to just dimple those areas. 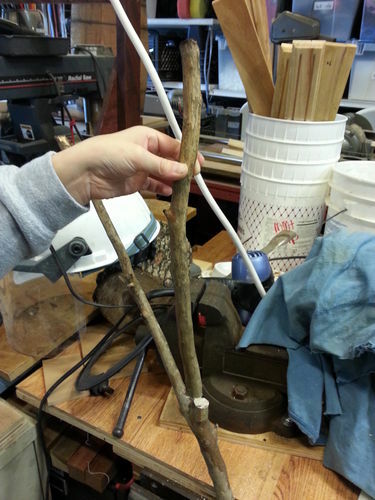 I broke out the dremel and grabbed a round-tipped carbide dental bur and started doing a Dr. Szell on the branch. After I finished the dental work I resanded those areas. I applied a mahogany stain for about 5 minutes, a liberal coat of teak oil for 5 minutes, then took the wand in and set in over the mantel to do a quick dry. A couple hours later I brought it back to the shop and polished it with the Beall Buff system. Hey !!! 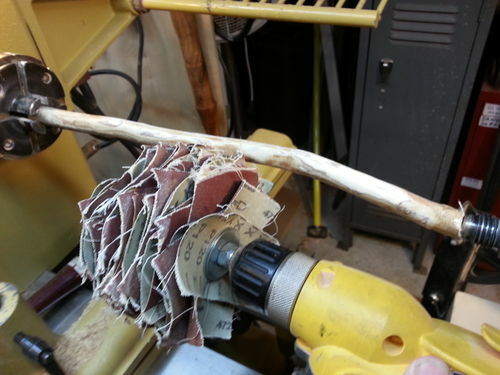 is the a home made sanding mop? Well done Pete. Creative idea with the sanding mop. Opps typo in the above post. It is a home made sanding mop. Wow, that came out very cool Pete. A wonderful idea and your use of custom tools is fantastic. I have a maple and cheery tree which has a few branches that need to come off. Think I just found an amazing project for them!